Best wishes to all our Sixth and Third Year in their Junior and Leaving Certificate examination. The Sixth Year Graduation Ceremony was on Tuesday, 19th May. Bishop Raymond Field concelebrated the Graduation Mass with Fr. Michael Murtagh. 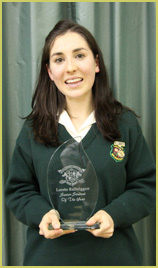 Evelyn Kimmage , Senior Student of the Year. Well done to the Tennis Team who won the Leinster Schools Final. The team are Naoise Dunne, Hannah Scott, Jenny Power, Ciara Dunne, Gillian Smith, Roryanne Sweeney. House examinations are occurring this week and next. Junior & Leaving Certificate Art Exams took place this week. Well done also, to the U.14 soccer team on qualifying for the Leinster Final. Transition Year Interviews for assessment are currently taking place. Students have the opportunity to present pieces of work that they are particularly proud of. These pieces are then considered as part of their overall grades. Parents Association meeting took place on Thursday, 7th May. Second & Fifth Years are involved in a number of fundraising activities this week. The monies raised will go to Downs Syndrome Ireland & A.S.S.I.S.I. Orphanage in India. The tennis season has started. All teams have been successful this far. Art practical examinations at Junior & Leaving Certificate are next week. All students and teachers are welcomed back for what is always a busy final term. The U-14 soccer team were defeated in today’s Leinster quarter-final against Alexandra College. Best wishes to the T.Y. group involved in the Public Access to Law Mock Trial in the Four Courts on Saturday, 25th April. The T.Y. Film Studies Group are involved in a Five Day project in writing, producing, directing and editing their own film with experienced professionals. The girls will receive a copy of their film on DVD. The inaugural Loreto Balbriggan Golf Tournament took place on Wednesday, 22nd in Balbriggan Golf Club. The winner was Naomi Phillips who plays in Laytown Golf Club. Many thanks to Balbriggan Golf Club for their support. Fifth Year students were on a Geography Field Trip to the Burren. First Year RSE talks took place this week. Our new School's Admission Policy is now available to download from the website. Well done to all concerned with the major fund raiser for Loreto, Rumbek, South Sudan. The different year groups wore a different coloured t-shirt and contributed €5 to Rumbek. Particular congratulations to the Senior Choir who participated in the Feis Ceoil. The choir achieved second place in the Turner Higgins Cup and first place in the Cor Ianbhuncoile Tri Phairt with 94%. The choir was recorded by R.T.E. and appeared on An Nuacht on Tuesday, 24th March and R.T.E. Childrens’ News that evening (available on the R.T.E. 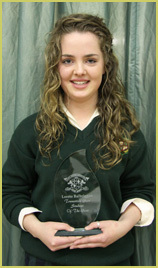 archive website) Jane Lawrence (6th Year) was interviewed on An Nuacht. Third Years had Transition and Senior Cycle Options Night on Tuesday, 30th April. A happy Easter to all the school community. The Transition Year Musical “Guys and Dolls” has been a tremendous success. Congratulations to all involved. Irish Orals took place this week for Leaving Certificate, as did Home Economics and Music Practicals. Well done to the U-16 soccer team on their victory over Loreto Crumlin. Michael Kennedy, T.D. and James Reilly, T.D. visited a C.S.P.E. group as part of the Oireachtas outreach to school groups. Well done to the U-14 soccer team who had a big win over Portmarnock. Congratulations to the YSI team who held a fund-raiser Bag Pack in Dunnes Stores, Balbriggan Saturday 21st. They raised over €700 in aid of the Irish Cancer Society. Well done to all involved. Hockey teams are also playing matches this week. Many activities associated with Seachtain na Gaelige took place this week. 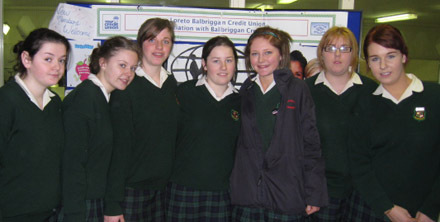 Loreto Balbriggan’s International Students Day was a great success on Monday, 16th March. “Guys and Dolls”, the T.Y. Musical takes place next week. The credit union is busy as usual this year encouraging students to become savers. The School Credit Union team from left to right, Sarah Hickey, Dervla Ryan, Eadaoin McGuiness, Olivia Leonard, Hannah Timmons, Jessica Whelan and Niamh Kennedy. Absent from photo is Sally Anne Downes. It's hard to believe it's been 25 years! Please email: [email protected] to confirm attendance, including email address or current home address & contact no: (home or mobile). Please upload your favourite photos, or email them to [email protected]. If you know of any past pupil from this year, please bring this reunion notice to their attention. 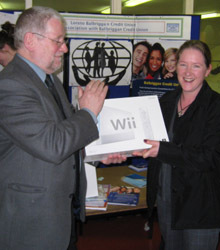 Well done to Caroline Brennan on winning a laptop for the school for her S.P.H.E. essay on Drug Abuse. Transition Years are involved in rehearsals for the upcoming musical “Guys and Dolls”. Senior Choir were involved in the Emmanuelle Concert in the Helix on Wednesday. Well done in particular to soloists, Riona Smith, Denise Morgan and Emma Jayne Corcoran. Ms. Abina Ferris has replaced Ms. Anne Kenna as chaplain until the end of the academic year. The school credit union is open both lunchtimes on Thursday. Well done to the two T.Y. mini companies – Everest Entertainment and Calendar Girls – who participated in the Fingal Enterprise Mini Companies Day in the Grand Hotel, Malahide. Transition Year students are involved in extensive rehearsals for their musical “Guys and Dolls”. 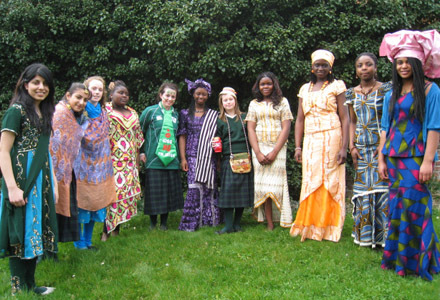 Preparations are taking place for the school’s Inter Cultural Day on March 16th. Third Years took their DATs test this week. Best wishes to all our prospective students for First Year, September 2009 as they take their assessment tests. Tomorrow, Ash Wednesday, is National No Smoking Day. To raise awareness they YSI group are handing out leaflets to help people quit. They will also be putting up leaflets to help people quit. The school community are delighted to be given the go-ahead for their major extension later this year. Best wishes to the 5th Year students and teachers on their ski trip over mid term. Mock examinations end on Friday, 13th February. Well done to Sorcha Forde on reaching the finals of the Soroptimist Public Speaking Competition in Athlone in February. Hard luck to the 1st Year Basketball team on their narrow defeats this week. Best wishes to the entire school community over the mid term break. Best wishes to Sorcha Forde in the Soroptomist Public Speaking Competition. Congratulations to the Hockey team on their victories during the week. Mock Examinations are still in progress. Transition Year remain on work experience. There were a number of hockey matches on this week. Well done to all. Best wishes to Sorcha Forde and Alexa Donnelly who are participating in the Soroptimist Public Speaking Competition this weekend. Rehearsals for the Transition Year production of “Guys and Dolls” are at an advanced stage. Preparation for Mary Ward week are well advanced. This year’s celebration of the life of our foundress will culminate in a 400th Anniversary Mass in Mullingar Cathedral. The Mock Examination Timetable is available to download. Shane Martin (Moodwatchers) gave an informative and helpful talk to 6th Years on dealing with examination stress. The Leaving Certificate and Junior Certificate timetables were given to classes this week. They are also available on the Department of Education website. Music students are on a Music trip to London this weekend. A T.Y. group visited the Young Scientist Exhibition in the R.D.S. This has been an exceptionally busy week in the school with many events. Transition Year musical students have been at song writing workshops. Transition Year Science students have enjoyed “Debating Science Issues” . There has been on-going preparation for the Christmas Carol service and Christmas concert. Second and Sixth Years have been involved in R.S.E. workshops. Transition Year Art students are involved in a Photography course. A Third Year Science group have visited W5 Science Exhibition in Belfast . 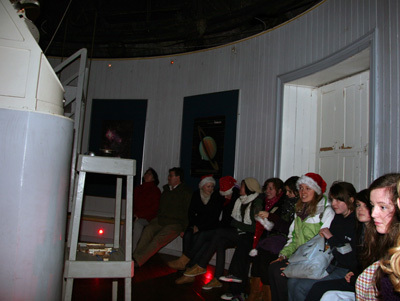 A group of senior physics students attended Dunsink Observatory on the evening of Wednesday, 17th. Well done to Jessica Maguire who appeared on the R.T.E. Seoige Show for her fundraising for Temple Street. All Senior Prefects attended a very effective training morning delivered by Shane Martin. Mr. Michael Denny (Loreto Education Officer) and Sr. Kathleen McCelland spoke to all Transition Years about an Irish/Kenya link and the new Loreto school in Rumbek. The Christmas Carol Service is in the Balbriggan Parish Church on Monday. The school will have a half day on Tuesday followed by our traditional Christmas Concert. Well done to the 3G class who organized a breakfast fund-raiser for Self Help Africa. Also, well done to the 2A class who organized a Christmas Crazy Sock Day for 2nd Years. Funds going to the Irish Guide Dogs. 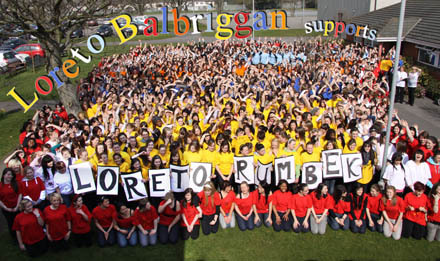 With best wishes for Christmas and 2009 to all associated with Loreto Secondary School, Balbriggan. Well done to all concerned with the wonderful Ceol Loreto Gig on Thursday 11th. As always, the talent on show was outstanding. Fifth and Sixth Year music classes are attending a workshop in the National Concert Hall on Friday 12th. Well done to Jessica Maguire on her fundraising for Temple Street Hospital. Jessica will appear on The Seoige Show next week. Congratulations to the Hockey/Basketball/Soccer and Gaelic teams on their performances this week. Transition Year Art students are involved in a photography Workshop this week. A festive non-uniform day for Fifth Years in aid of Temple Street was held on Friday 12th. Well done to the Fourth Year Fashion Show team, the Transition Year models and particularly Ms. Lennon and Ms. Briscoe on two outstanding Fashion Show nights. 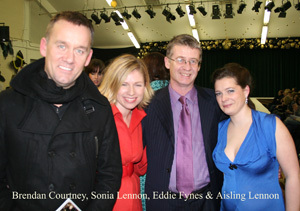 The Tuesday night’s show was opened by “Off the Rails” presenters Sonia Lennon and Brendan Courtney. A beautiful Taize Remembrance Evening was held in the school on Thursday, 27th November. This lovely evening was organized by Ms. McFadden and Ms. Kenna. Best wishes to Lyndsey Pulsford who performed in the Poetry Aloud Competition on Friday. Well done also to the U-13, U-14 and U-18 soccer teams on their respective victories this week..
Senior, Junior and Minor Hockey teams had successful matches this week. Congratulations to Natalie Duda on creating this year’s school Christmas card. 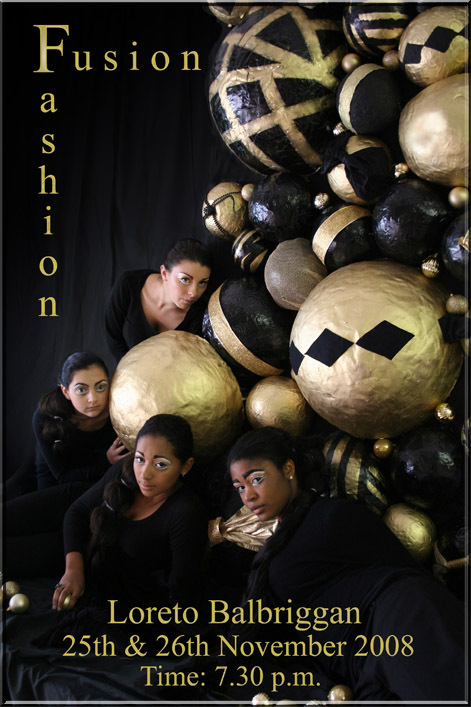 Preparations for the Transition Year Fashion Show are well advanced.The show will be on the 25th & 26th November. Well done to the U.16 soccer team on defeating Portmarnock Community College, 4 – 0. Congratulations to the Junior Choir and Senior Choir on winning the prestigious Choral Festival.The Senior Choir are involved in a workshop in City North Hotel with Clongowes School on Friday, 21st November. Third Years attended a performance of the Merchant of Venice. Congratulations to hockey and basketball teams on their performance this week. The Ultimate Frisbee team were involved in their first competition on Friday, 21st. Two students – Sorcha Forde and Rebecca Dolan were part of a group of 12 students from 6 schools in Ireland who travelled to Brussels to raise awareness about the Millenium Development Goals urging EU leaders to keep the promises they have made. 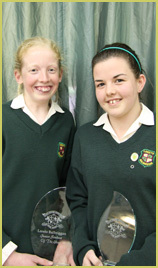 Rebecca and Sorcha specifically focused on MDG2 – Achieving Universal Primary Education. Well done to U.14 and U.16 soccer teams on their victories this week. Hockey and Basketball teams were also in action with excellent performances. Fifth Year History students visited Kilmainham Jail as part of their studies. This week is Science Week across the country with schools becoming involved in a variety of Science activities. Sports Captains and Students Leadership personnel in the school have organized a petition protesting at the education cutbacks in the Budget. T.Y. students are involved in Public Access to Law this week. Congratulations to Neasa Forde, Reem al Sabat and Rebecca Vickers on winning the High Achievers Awards in U.C.D. based on their 2008 Leaving Certificate results. Congratulations also to Alison Fynes, Jess Garvey, Aisling O’Leary and Louise Reynolds on winning Entrance Exhibition Awards to Trinity College based on their 2008 Leaving Certificate results. First Years had an S.P.H.E. Anti Bullying workshop this week. Third Year classes were on retreat on Thursday and Friday. Well done to the U.14 soccer team who defeated Loreto, Swords this week. Hard luck to the U.18’s on the narrow defeat. The second year hockey team were narrowly beaten by Loreto, Foxrock. Well done to Elizabeth McEnaney and Sarah Bouzzah on being selected for the Leinster U.16 football panel. The Third Year Parent/Teacher meeting occurred on Tuesday, 4th November. Parents Association are planning a Christmas Fund raising raffle. Preparations for the Transition Year Fashion Show at the end of November are well advanced. Two great nights entertainment are certain. A letter requesting parental support on the budget cutbacks will be forwarded early next week. 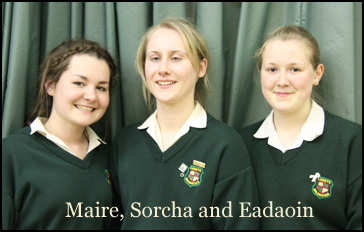 Cathy Berger, Aine Gibney and Katie Fleming represented the school at Comhairle na nOg. Cathy was elected to the representative council. Best wishes to Sorcha Forde and Rebecca Dolan who are representing the school lobbying for Millennium Goals in Brussels next week. Well done to the senior Gaelic team on their victory over Dominican College. Sixth Year week of Directed Prayer takes place in the convent this week. Father Peter McVerry gave an inspirational talk to Sixth Year students. A Sixth Year Geography Field Trip to the Burren also happened this Wednesday and Thursday. The Under 16 Gaelic team had a good victory over Loreto Swords. The U.14 Soccer team are to play Portmarnock Community College on Friday 24th. Basketball teams also competed this week. Five hockey teams played a number of different schools during the week. A wonderful Ceol Loreto Gig took place on Thursday, 23rd showcasing the marvelous talent in the school. The School’s Homework Policy is now available on this website. Fifth Year Retreats took place this week. Transition Years had visits to the Rosemary Smith Think Awareness Driving school and the Botanic Gardens. Ultimate Frisbee began this week. All interested should contact Ms. Fleming. Geography and Science trips also took place this week. Students were involved in the Loreto Justice, Peace and Integrity of Creation Conference in Emmaus House. The U.16 soccer team defeated Hartstown in the Leinster Cup. Students were involved in various activities associated with national Maths Week. Student Council Training took place on Sunday, 19th October. Congratulations to Ms. O’Connor and her team on winning for the school the Fingal County Council’s Best Presented Secondary School Grounds award. A school Newsletter will be forwarded next week. A leaflet on a Parenting Course has been forwarded to the students. Congratulations to all students involved in the Poetry Ireland “Poetry Aloud” competition in the National Museum. Well done to Lindsay Pulsford on reaching the next round. First Year students went on Retreat to Armagh this week. Transition Year Ecology trips continued . The Under 16 Gaelic Team were narrowly defeated by Ashbourne Community School. A second year class returned from a successful and enjoyable trip to Stratford-on-Avon. Relationship and Sexuality talks for 4th Years were provided by Accord. The Under 16 and Under 14 Soccer teams began their season this week. A second year English class are traveling to Stratford on Avon this weekend. Registration for incoming First Years, September 2009 took place on Wednesday, 24th September . The first Gaelic match of the season was on Friday, 26th September. Ongoing Ecology trips took place this week. An Ultimate Frisbee Group has been set up by Ms. Fleming. Twinning Assemblies took place this week . Fifth Year students visited IMMA on Wednesday, 24th as part of their Leaving Certificate course. We are delighted to welcome all our new students and staff for the upcoming academic year. Well done to our outgoing Sixth Years, on their excellent Leaving Certificate results in August. Best wishes for the year ahead, whether it is work or college. Transition Years are traveling to Westport for an Adventure week next week. Junior Certificate results will be in the school on Wednesday morning. They can be picked up at 10 a.m. The results of the students in Westport will be faxed to the teachers there.